Ivory Coast: "The Hospital Had 20 Beds, We Currently Have 90 Patients"
Large numbers of patients sought treatment at the MSF-supported Abobo Sud Hospital during a surge of violence in March. As traffic resumes around the eastern Ivory Coast city of Abidjan—where people were previously trapped by post-election violence—wounded patients continue to arrive at Abobo Sud Hospital, where Doctors Without Borders/Médecins Sans Frontières (MSF) is working. Having been restricted to the hospital for the past 10 days, the MSF team is now expanding activities. MSF Head of Mission in Abidjan, Sal-ha Issoufou, spoke about the current situation and future plans. What have the past two weeks been like? For 10 days, up to April 11, Abidjan’s health facilities were practically inaccessible to the sick and wounded. Given the risks, inhabitants stayed locked up at home, many healthcare workers could not get to their workplace, and ambulance services stopped. During this period, the hospital in Abobo Sud where we work was accessible only to the inhabitants of the neighborhood or those that risked coming by their own means of transport. It was impossible to relieve our team for 10 days. Up to April 11, when we received 80 wounded, the team was facing an average of 25 to 30 causalities daily, not including the sick and the increasing numbers of women that had been coming to give birth at the hospital. How has the situation evolved since then? The level of violence has decreased, but has not yet completely stopped. Pillaging and robberies continue in certain neighborhoods of Abidjan. We received 15 to 20 wounded over Tuesday and Wednesday. Today we’ve already received 20. 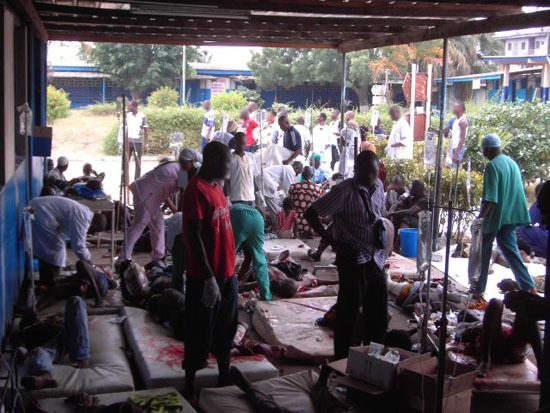 The patients are mainly victims of road accidents, attacks or gunshot wounds. It is not only the fact that traffic is circulating again; the accidents are mainly due to car thefts escalating into more serious situations with tensions running high. Abobo Sud Hospital was already overflowing; today there is simply not enough room to care for all the wounded. The hospital initially had 20 beds. We currently have 90 hospitalized patients! Do you intend to extend activities? We’ve got no choice; we have already started setting up temporary tents for the patients that are in the hospital lobby for the moment. We have started working in Anyama Hospital, 45 minutes from Abobo. Located in another district, this referral hospital will help relieve the pressure on the facility we are currently working in by transferring patients that need long-term hospitalization, particularly reconstructive surgery. This new facility will also help us improve our emergency response; we are planning to equip the operating theater, which should be functional by the end of the week. We have also started providing support to four health facilities in the Abobo and Anyama neighborhoods by donating medicines and helping with human resources when needed. The most critical cases are transferred from these facilities to the hospitals were we work.